Yes, summer is here. It has been a few weeks since our last Hail Pelicus and yours truly has spent the time herding llamas in the Andes. That, and working on my repertoire of “yo mama” jokes. Have you ever tried to “yo mama” a llama? Those long necked Andean freaks are brutal. The rugby world didn’t stop, however, and momentous things have been happening. Championships were won and lost and the seasons turned, as they often do, from 15s to 7s. It is a sacred duty to delight and inform the Pelicani about such things and thus do I fulfill my obligations. Yes, I know the song above refers to a different Rio but I have it on good authority that Rio de Janeiro has sand and the women do a fair amount of dancing there. Why should we care about the terpsichorean tendencies of our South American friends? That is simple: the US Men’s and Women’s 7s teams BOTH qualified for the 2016 Olympic Games to be held in Rio de Janeiro. These dedicated men and women worked hard to realize their dream and now get to show the world their on their O(lympic) face. The women are starting off fresh – the men have a pair of dusty old gold medals to defend. Based on recent results we could very well see both teams take top honors. Both the men and the women cruised through the NACRA Qualifying tournament with impressive wins over unimpressive sides. Politics, culture and geography dictate that the North American and Caribbean countries duke it out amongst themselves to see who gets the automatic bid to the Olympics and who has to try again with the repechage tournament, officially known as the “Final 2016 Men’s Olympic Qualifying Tournament” while unofficially known as the Last Chance Saloon. EDITOR’S NOTE: An accident of geography has made our region a difficult one to name in any sport. NACRA barely rolls off the tongue as “North American Caribbean Rugby Association” and is probably as good as it is going to get. I believe the powers that be looked at the mess soccer made with CONCACAF, the “Confederation of North, Central American and Caribbean Association Football” and wanted no part of it. 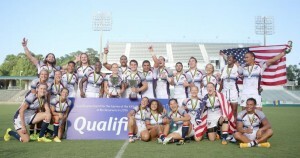 The US Women are one of the best teams in the world and faced no significant challenges – the other regional power Canada had already qualified via their place in the World 7s Series. The US was able to qualify with ease as the class of the US women was not to be denied. The US women were impressive in all phases and more than up for the task. The US Men are staking their claim as one of the best in the world and were able to cruise through pool play with some ridiculous scores while the Great Rival did the same in the opposite pool. This set up the expected clash in the final: USA v Canada. Canada has always been our greatest rival and matches against them were always tough. Up through the 2013-2014 7s Series Canada had dominated the Americans but after the hiring of Mike Friday for the 2014-2015 7s Series the pendulum swung back to the US. Or did it? A humiliating, record breaking, shutout loss in the Glasgow 7s proved that Canada could beat the stuffing out of us if we weren’t on top of our game. Once the game started all doubt was erased as the US took control early and never let go. Canada made some breaks and put pressure on the US but a lost penalty in a great attacking position at the end of the first half followed by a try given up at the start of the second half ended the final realistic chance the Canadians had and the US was victorious. Cool as the other side of a cucumber. I do wish the Canadians luck in their final qualifying tournament as it would be wonderful for NACRA rugby to have both powers represented for both the men and the women. The numerous connections of the current USA teams to Pelicanland has been detailed before so we won’t go into it again here except to say that our influence is so great that even the latecomer to the squad, Chris Wyles, has a Nor Cal connection. When I last saw him I showed him a map of the US and he immediately, almost instinctively was able to point out California. Well done, indeed. We must look to the past then, to really appreciate the depth of the Pelican contribution to Olympic rugby. For the gold medal teams of 1920 and 1924 ALL of the players came from Northern California. Every. Single. One. For a more complete history than I can provide here I suggest going to http://www.agiantawakens.com/ and buying the movie. It is worth it. I have one final note before tabling the topic of Olympic Rugby. If there is anyone from USA Rugby – I’m looking at you Pelicus Editorem Minimus, Ex Dux – or the USOC who reads this missive and has a say in the design of the USA jerseys, please take moment to consider the more subtle aspects of the team jerseys. It is customary in some sports to put a star above the crest to indicate a world championship or an Olympic gold medal. Some of the more astute readers who followed the USA Women’s Soccer team to their recent World Cup championship may have noticed this. A couple of stars above the USA crest would remind the world that we are – at least on the men’s team – the 2 time defending Olympic Champions. The roll call of USA National Champions out of Pelicanland just keeps getting longer. Congratulations to Life West Gladiators for the Men’s D2 National Championship with a 43-24 win over Wisconsin. Well done! Loyal readers will recall how this publication reported on the chicken uprising touched off by the announcement that the NCRRS will be holding their annual banquet at the Sonoma Chicken Coop, what is being dubbed by the media as the Chicken Spring. For the last several weeks our humble correspondent has been embedded with the troops led by Colonel Sanders, whose experience in chicken warfare goes back decades. I can barely count the number of times my assigned monitor Pfc Herb and I travelled the Spice Road together. Well it was 11 times, so I guess I can count it. “11 Herb; Spice” read the report we sent to Colonel Sander. In any case the chicken revolt continued. Propaganda and statements were hurled back and forth by each side. “I don’t want to be a pie. I don’t like gravy” said a spokeschicken. This epic contest came to its conclusion in the decisive Battle of the Barnyard when finally the chicken’s sweet, slightly spicy leader General Tso surrendered. Now that the feathers have settled the Pelican Elders will be holding our Annual Awards Banquet in San Jose on Friday, July 17 at the Sonoma Chicken Coop on Skyport Drive – right by Avaya Stadium where the internationals will be held. There is rumored to be a special guest speaker so mark this event on your calendar. Please RSVP via email to Jim Crenshaw at crenshaw@cal.net with how many guests you are bringing. Cost: All NCRRS members receive a free meal – guests cost $50.00. Below we have Steven Fenaroli’s report from the Calgary exchange. Flying out of Sacramento, I never realized how close Calgary was. After a two short flights I had arrived. Anyone who billets in a different city knows about the lack of details/plan and suffice to say I was nervous about any questions the customs officers would have for me regarding my accommodations. I found David Robinson no problem, and he and I left the airport for his third time that night. He gave me a lay of the land on the way to the hotel where I would meet up with Tom Franzoia. My goal going into the Stampede was to enjoy the city and take in as much information as possible to improve my refereeing. Saturday, Tom and I had the morning to ourselves so we walked the 3km to the Calgary Rugby Union to get a look at the pitch during the day. There are 5 pitches, with field 1 which has a grandstand and a clubhouse overlooking. The fields were in top shape and it left me with water envy from our drought. We would later learn that the water bill for the Calgary Rugby was sizeable. David picked us up later that morning and we split up. Some went to the Stampede for the afternoon, however David, visiting referee Toby Mustill from Vancouver, BC, and I all went to Banff for the afternoon. The weather was fantastic in the mid 80s (the conversion from metric to imperial the whole weekend left my brain sore). Banff is a small tourist town set among the Rockies in the Banff National Park. Anyone who has seen a picture of Lake Louise’s blue glacier runoff water knows the picturesque views. After lunch, we went to the local rugby pitch which is set in the valley and runs along the river with towering mountains on all side. It truly is one of the most scenic rugby pitches I have been fortunate to see. Friday night we were slated for 10 games in the Mens and Womens Premiere division. We were running teams of 5 with ARs and In-Goals. Everyone got their turn in the center the Friday proved to be a good warmup for a long Saturday with 95 games going on all five fields. The matches ended just before 9pm and the even later 10pm sunset made for a gorgeous view to end the day. There was a men’s premiere, women’s premiere, men’s semi competitive, men’s social, women’s social division in this tournament. Everyone came for a good time, but like always, the social players had a bit more flare. My favorites were the guys in cut denim shirts and jackets and one guy who cut his only pair of jeans 5 minutes before a game so he could have denim shorts as well. Saturday brought a wealth of games and being that it was Independence Day, it was only fitting for me to wear some Red, White and Blue flag socks to go with our outstanding Stampede 7s kit. I started my morning off with a U18 game and a men’s social back to back. With the number of refs we all had a good break in between our games. The rest of the day I would be doing men’s and women’s premiere. A total of 7 matches capped off with being given the men’s premiere final. I was a bit nervous at the challenge, but all of the folks had confidence in me. Their tips during the tournament helped me drastically improve my game in a matter of days. During the men’s semi competitive final the sky opened up and the looming storm gave way to marble sized hail and a torrential downpour. With the game on hold, all sought shelter until the lightning had passed. The final consisted of Irish and Batus a bit later; both whom I had refereed. Irish was a strong team but couldn’t make the tackles they needed and Batus broke away. Irish kept it close going into the second half and even looked poised to make a comeback, but they couldn’t put the pieces together for the win. Batus won the men’s premiere and were drinking out of the Cup for the rest of the night and into the bar. The friendliness and welcoming nature of Calgarians was amazing. Maybe not as much when we think about the nature of rugby and the ability to transcend borders, languages and traditions. At the end of the day, we have the shared experience and the common goal of trying preserve the legacy of those who laid the groundwork and to give back to those who come after. I was flying out Sunday the 5th and come to find out that David’s birthday was that day. Fortunately for him, he would be going to Edmonton for the double header. David and his wife Lisa were incredibly gracious for hosting us. The Calgary Rugby Union put on a great tournament, and Rugby Alberta has amazing match officials who were always willing to give tips to improve. In the end, my time in Calgary was memorable and the friends made plentiful. I made my first visit to the fabled Kezar stadium on a Saturday night in June, resplendent in San Francisco summer: overcast with a chill wind whipping down the field from the west. The grass pitch was in immaculate condition, and a crowd of several hundred had gathered for the return of representative rugby to this storied venue. With Nome and Kevin on the sidelines, the visiting Durham University RFC second XV – in their white strip with purple hoops – kicked off into the wind to begin our festivities. The Pelicans Development XV scored first, 6 minutes in, before Durham equalized a few minutes later, and a long stalemate ensued, punctuated by a litany of injuries. Nor Cal physicality and direct running jousted with savvy breakdown play and ball carrying from Durham, whose structure and pace in the backs persistently threatened. Durham were finally rewarded with the go ahead try and conversion in the 35th minute. 5-12 the score at half time, along with a dislocated shoulder and a torn ACL. Durham added a penalty goal early in the second half to extend their lead to ten points, only for the Pelicans to pull back to within three with a converted try a few minutes later. Three point game in the 55th minute, with the Pelicans trailing their guests 12-15. The Pelicans then went under the cosh in an extended goal-line siege during which the Pelican scrum went down while retreating over the line twice. Durham got their third try under advantage on the next one, and the Pelicans avoided conceding the penalty try. Roaring (or do Pelicans squawk?) back into the match, the Pelicans grabbed another converted try in the 75th minute to cut Durham’s lead once again. 19-22 Durham with 4 minutes left. Game on! A flowing move from Durham put them in in the corner (with Nome beautifully positioned right there) to put the game out of the Pelicans’ reach. This game had more injuries in one match than I’ve had in all my other matches this season. All the best to the players for speedy and full recoveries. Thanks to both teams for a cracking match. Many thanks also to Kevin Donnelly and Nome Tiatia for their valuable assistance as ARs, and most of all thanks to Pete Smith for his tireless work putting on this event and reinvigorating representative rugby in Nor Cal. It was a pleasure meeting the Durham University RFC players and touring party. I will long remember the purple blazers with white trim. In Northern California we rarely have the opportunity to referee teams with such sartorial elegance, which was matched only by the grace of their generous remarks when we repaired across the road to the other Kezar. Thanks for making the trip, Durham. I hope you had a great finish to the tour. For those illustrious readers of Hail Pelicus who weren’t at Kezar, you missed out. Next time the Pelicans are playing, come on out and enjoy some great rugby. I got the first match of the day/event in the Boy Varsity in a matchup between the SoCal Griffins and PNW Loggers. Kick off was at 8 am and only 88 degrees at the opening whistle. It was good to see that the captains knew each other considering the geographic distance between them. It was a very good game with end to end action. Both teams came very close to scoring tries if not for desperate defense and minor handling errors. SoCal started the scoring with a PK followed by an unconverted try by PNW to make it 5-3; SoCal slotted another PK to go into halftime up 6-5. The score was not indicative of the quality of play, my first scum was 9 minutes in and I didn’t have a penalty before the first water break at 15 minutes…touch, knock-ons, loose passes and solid defense by both teams kept them from blowing up the scoreboard. More of the same in the second half with SoCal adding another PK about 20 minutes in making it 9-5 SoCal. With the temp clearly cresting 90 degrees the boys from PNW started feeling the heat, they let a try slip past to bump the score to 14-5. SoCal added a final try at full time that was well earned, but a PNW player attempted to trip the Griffin while centering the try so Penalty Try officially with a yellow card to the offending player…Final tally 21-5 in favor of SoCal Griffins. Very competitive mid-day match between the NorCal and SCal Boys JV Select sides. Despite the heat and the fact that this was the second match of the day for these players, the game was fast and aggressive. The final score doesnt reflect how close this game was, with the game ending on a try by SoCal as part of their tremendous late-second-half effort to over-take NorCal. EDITOR’S NOTE: “The final score doesnt reflect how close this game was” – Well, that seems odd since you reported a 0-0 score. How much closer do you want it to be? Life won but a few other men’s teams impressed; Sacramento Caps, Vacaville, Modesto & Aptos. We could have used a few more refs (only 2 out of the 10 assigned refs showed up) but local captain/coach Ahmed showed he could be a great ref–somebody get him certified & he could be doing Division 1 games within a year. 10:00 am came around with only one ref (me) and two games kicking off. I talked a Marin player, Hamed Beytollah, into starting one field as a ref and I took the other. We just stood on the field , one team after another, reffing games one after another. Bruce Bernstein showed up by my 5th game and gave me a break for 15 minutes. Evie traded jerseys from playing and reffed two games, otherwise, I reffed 14 games, Hamed had 15 games and Bruce reffed 8-10 games, some of them really good games. Standout teams were East Bay Blues, Modesto, Life West, Aptos, Marin and Sacramento Capitals. Championship mens’ game was Life beating Sacramento Capitals, good game. In womens, the championship was Life West against Berkeley Blues with Life West prevailing. Clean play by almost everyone. The tournament worked, but would have been better with more refs. Summer feels like it finally arrives once the sevens season kicks off. Summer was thus a little late for me as I missed the Worcester 7s tournament on June 20. But I can’t think of a better place to kick off summer in New England than Newport. There were four divisions at the tournament: women, men’s open, men’s NERFU and men’s Northeast Championships. Six matches were on tap for me, starting at 9:20 and last match starting at 4:20. Darkside is a summer sevens team, newly formed this year with some great athletes. They should seriously consider going up a bracket next year. Old Blue owned this one. It was a fun fast match, not a lot of stoppages for anything. Ball in hand, good movement and little penalties. URI were a combo student/alumni team. Youth and speed won this one. Once the URI runners broke a tackle, it was try time. Generally the ball stayed in the middle of the field. Lots of 15s style rucking and mauling. A good match to have right after lunch. Not a great amount of running. WASPS are a Boston area 7s side. Seemed mostly semi-competitive side made of Old Gold, Charles River and other assortment of players not on Boston, BIW or Mystic River. They were no match for a solid New Haven side. The legs were getting a little heavy by this time. New Haven had the talent, speed and force. Old Blue, being the 3rd side were made up of new ruggers and college kids. Mostly a Old Blue D3 side. Score was 0-17 at the half, so kudos to Old Blue for matching tries with New Haven in the second half. The pace was miles faster than any of the other matches. NYAC had the advantage early on, setting good attacking platforms against a bumbling Old Blue side. Half-time score was 10-7 NYAC. The second have was totally different. Old Blue corrected their issues shut out NYAC in the second half scoring 3 tries to Old Blue’s 0 tries. Old Blue then went on to win the Cup Final against Mystic River. Eric Rauscher, Nome Tiatia, Jeff Jury, Bruce Bernstien and I refereed to first leg of the new Carlsberg 7s Tournament this past Saturday. Well run day with no major injuries. Look forward to the next two. A solid game to break me into the 7s mode. Both teams were eager to play – well, they were once SFGG got on the field as apparently they didn’t look at the schedule. The game was fast and tight with a slight edge to SFGG for finishing skills. Both teams played well and will be pushing their respective A sides at training. Not as one sided as the score appears but Life West were dominant. San Jose had their chances but it always seemed as if the breakaway was thwarted by a last second dive to just hook the ball carrier’s jersey. Life West truly showed their dominance at the breakdown where they were able to poach several balls from the Seahawks. At For Pete’s Sake field in Santa Rosa, my home turf, we had a great day of Rugby including the weather, which was about between 70 degrees in the morning to about 75 degrees with a breeze the rest of the day. I had a first game at 9:00 with Berkeley Blues women beating the Seahawk Women s 29-5 and one Seahawk Woman getting a yellow and penalty try assessed. My next game was Seahawk Women beating Golden Gate women 25-17. My third game was Men’s Golden Gate beating San Jose Seahawks 31-0 and my last game was Men’s Life West beating San Jose Seahawks 26-12, in a pretty good game; San Jose received one yellow for a no wrap. Good, clean rugby for the most part; it seemed like everyone had a good time. It was great for me to work with and watch so many top refs! The USA Men and Women celebrate their Olympic berth. Photo credit Cody Schmelter. This entry was posted in News on July 8, 2015 by James Hinkin.